The Gas Cart, with its big coils and counters, is specifically designed for large gas targets. The main 1.5 m diameter Helmholtz coils provide magnetic field up to 330 G (33 mT) directly horizontally along or across the beam direction, and homogeneous to ~1% over a 5 litre volume. There were also two other pairs of coils, capable of generating a few gauss, which were used to accurately zero the field and to provide a weak vertical field when necessary. Arrays of counters (25 x 45 cm) are mounted above and below the center, with the top set movable vertically. 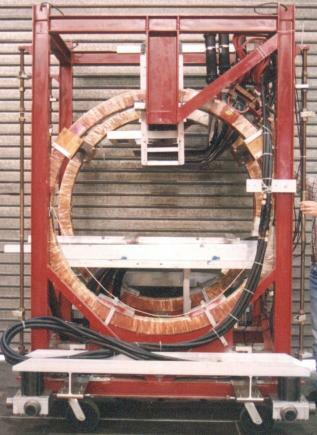 The gas pressure vessels roll on aluminum rails to position the muon stopping distribution in the center of the magnet and between the counters. 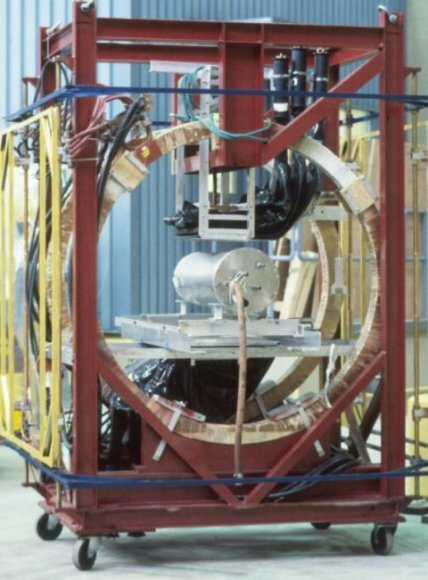 Although there are no facilities for solid state experiments, such as cryostat mounting, the roomy design will facilitate unorthodox setups and could be useful for zero field experiments.